The submission deadline has expired February 28, 2006. 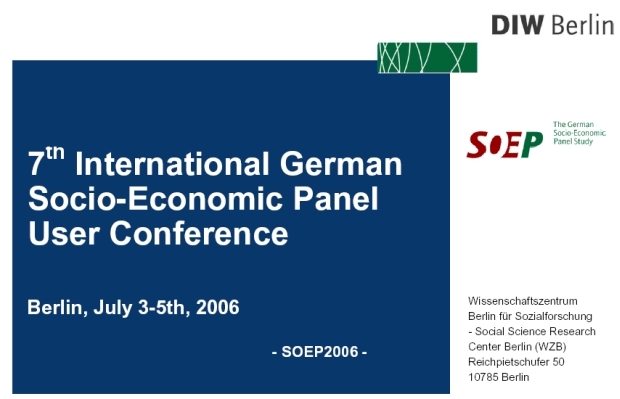 The 7th International Socio-Economic Panel User Conference (SOEP2006) will be held in Berlin, July 3-5, 2006, at the Wissenschaftszentrum Berlin für Sozialforschung - Social Science Research Center Berlin (WZB). The conference provides researchers who use the SOEP with the opportunity to present and discuss their work with other researchers familiar with the SOEP data. Researchers in all disciplines who use either the Public-Use version of the SOEP or the GSOEP part of the Cross-National Equivalent Files (CNEF) are encouraged to submit an abstract. Research making use of the longitudinal features of the German SOEP data is especially encouraged. Papers on survey methodology and cross-national comparative analysis are especially welcome as well. Public viewing of the Soccer World Championship 2006 semi-final on July 4, 9 pm at WZB. * Please note that we will not distribute any hard copies of the papers at the conference site, so please print the papers/abstracts you are interested in; they can be downloaded from the program | PDF, 169.47 KB . * Internet: There will be the (very limited) possibility to check emails in the Lobby. * Lunch: there is the possibility to take lunch at moderate prices at the WZB-Cantine; here some information | PDF, 405.41 KB on restaurants and delis in the vicinity of WZB. * Reception on July 4th: On July 4th conference participants are invited to a reception and a buffet at WZB. We will offer cold and warm dishes and among other dinks there will be beer on tap. For Soccer Fans there is the opportunity to watch the Soccer World Championship's semi final on a screen - if the weather is still fine, even on the terrace. Shorter versions of selected conference papers were published in a volume of conference proceedings (Journal of Applied Social Science Studies [Schmollers Jahrbuch], 1/2007) with the understanding that a full version of the paper may be submitted to another professional journal. We have blocked a restricted number of rooms at special rates for conference participants at Hotel Best Western Steglitz International. The Hotel is located in the South West of Berlin and both the conference site and the Center of Berlin (Brandenburg Gate) can easily be reached within 20-25 minutes by public transport. For more information on the hotel, please refer to www.si-hotel.com. If you are presenter at SOEP 2006 please book your room according to the instructions we sent you via email. All other participants who wish to book a room at Best Western Steglitz International, please fill in the hotel reservation form | PDF, 22.73 KB and send it back to us. Reservation deadline is May 19, 2006, but we ask you to make your reservation as early as possible. Please note: Many hotels in Berlin will be fully booked in June/July or at least tend to raise their rates considerably, since the Soccer World Championship will take place in Germany this year from June 9th to July 9th. We are delighted to offer you the unique opportunity to participate in a workshop on Econometric Analysis for Panel Data Using Stata . The workshop will be held by David Drukker, Director Econometrics Stata Corp. The course starts directly after the 7th SOEP User Conference, July 5-6, 2006, at the Social Science Research Center Berlin (WZB). We ask scholars to travel on their own funds. If this is not possible, we may provide partial reimbursement of expenses to the person giving a paper (one grant per paper) at the following rates depending on which country presenters are coming from: up to € 125 (Germany), up to € 500 (Europe), up to € 750 (overseas). The Society of Friends of the DIW Berlin (VdF) honored the presenters of the best three papers. The SOEP2006 program committee chose the best three papers which were announced at the end of the conference.